As one of the oldest Norton clubs in the United States, we offer this web site for your viewing pleasure. The Greater Atlanta Norton Owners Association was formed in 1980 as a chapter of the United States Norton Owners Association. Our first meeting was held on March 20, at Manual's Tavern on Highland Ave. in Atlanta. 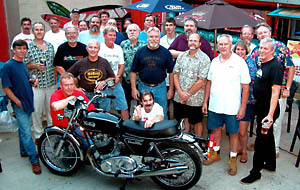 Twenty of the Norton Faithful, most of whom had never belonged to a motorcycle club, gathered to attempt to plan motorcycle events, help each other keep our Norton's running, design tee shirts, drink beer, and bring order out of the chaos. I'll let someone else decide how successful we were in those endeavors, but just point out that we're beyond or thirtieth year. We've hosted two National Rallies, and hosted the Nortona Picnic in Daytona since 1982. Along with the North Florida chapter, we put on the Turn Six Party for years at Daytona International Speedway. Turn 6 is now held at Barbers Vintage Festival in October at the Barbers Motor Sports Park in Birmingham, AL. We are always well represented at the National rallies, with many of our members riding and driving thousands of miles to attend. Along the way we've forged many lasting friendships, helped keep a lot of Norton's running, and had a lot of fun.